FORT KENT, Maine — Within an hour after the start of the 36th annual Fort Kent Arts & Craft Fair on Saturday, Nov. 26, vendor Jodi Guy had sold out all 16 packages of her home-baked pretzel buns. By 1 p.m. she sold out her entire inventory of baked goods: 20 loaves of bread, countless bags of bagels, and a tall stack of sweet sugar pies. Guy owns The Funny Farm, a bakery she runs out of her Market Street home in Fort Kent. This was her fourth year taking part in the two-day craft fair, which the Greater Fort Kent Area Chamber of Commerce sponsored on Saturday, Nov. 26 and Sunday, Nov. 27 at the University of Maine at Fort Kent Sports Center. 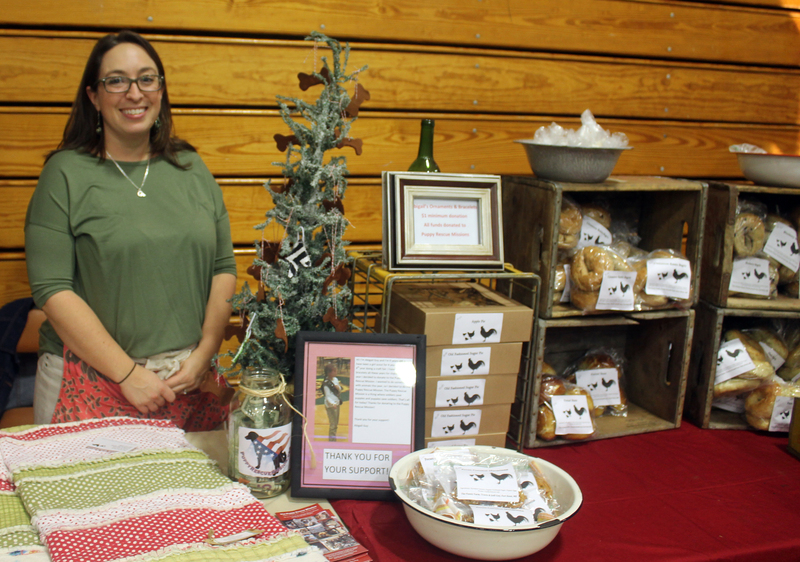 The annual community event has proven so successful for Guy that she, along with many other vendors, had already secured spots in the 2017 craft fair before this weekend’s event ended. “(I) had my paperwork and payment ready when I got there this morning,” Guy said on Sunday. More than 100 crafters from across New England and Canada sold goods at the fair, including Tory Jones, former Fiddlehead Focus/St. John Valley Times journalist, who left the area in April. Now a reporter for The Eagle Times in Claremont, New Hampshire, Jones made the trip north with handmade chalk mats, jewelry, and braided ribbon barrettes. 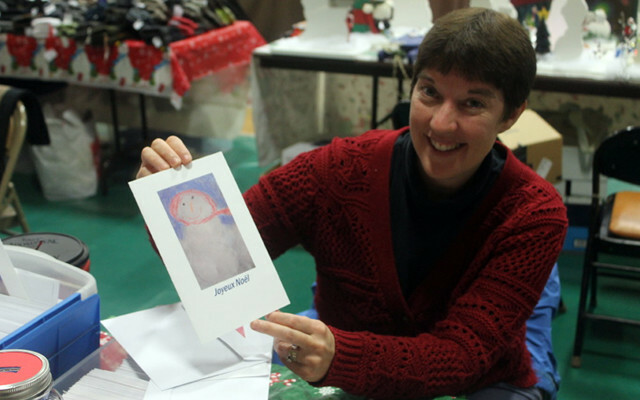 Jones grew up in Fort Kent and said she has participated in the craft fair for the past seven years. “It’s always been very busy. It’s great to see all of our best friends and family when I’m up here,” she said of returning for the fair. Jones’ 19-year-old daughter Sarah Bonenfant, a St. Thomas University psychology student, helped her mother with sales at the craft fair. “I’ve grown up behind this table and helping her. I love the craft show,” Bonenfant said. A local charity also seized upon the craft fair’s reputation for success and reaped rewards for those in need. Leslie Kelly, a board member at the Greater Fort Kent Ecumenical Food Pantry, manned a vendor booth at the fair, selling items which volunteers crafted and donated. These included Glenda Kelly’s homemade donuts. “Those go fast,” Leslie Kelly said. Food pantry treasurer Janelle Hurd converted images her late sister Joan Jandreau had captured into postcards to sell at the event. Lucien Jandreau designed wooden ornaments to sell. Kelly said the pantry’s need for food donations is greater now than it ever has been. Last week the food pantry gave away a record 131 Thanksgiving dinners to families experiencing food insecurity. “We delivered to the most families ever,” Kelly said. She expressed her gratitude for the craft fair visitors who supported the pantry over the weekend. “We did good. The community is good to us,” Kelly said with a smile. New to the fair was the addition of local merchants, who displayed their retail goods or advertised their services in a classroom near the Sports Center gymnasium. 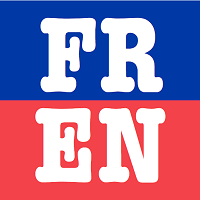 Norma Landry, president of the Greater Fort Kent Area Chamber of Commerce, said they chose to add the merchants at the request of chamber members who may not have a storefront. Landry said the Chamber board will review the pros and cons of the new merchant addition to the fair and determine whether to continue with the practice in the future. 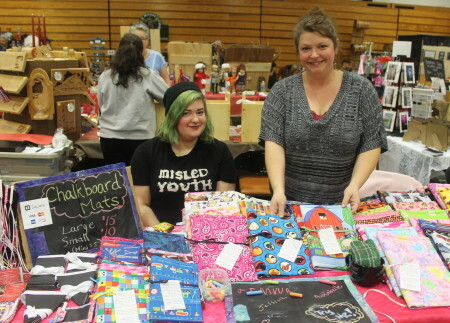 The Saturday after Thanksgiving is known in the St. John Valley and nationally as Shop Small Saturday, and so local merchants were able to participate in the popular community fair. In fact, the weekend event drew in more than 1,900 shoppers, according to GFKACC Executive Director Dona Saucier. Like Jodi Guy, many vendors had such good sales over the weekend that they are planning to ahead for 2017. “Approximately 90 percent of our vendors registered to come back next year,” Saucier said. And if The Funny Farm’s sales are any indicator, there will be plenty for shoppers next Thanksgiving weekend in 2017. “I will be making two to three times more bread for Saturday next year. It’s going into my notes,” Guy said.